The Writer for Sports-Ed is on vacation this week but we hope you enjoy the rest of this issue. The writer will be back for next issue. 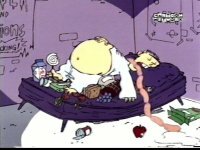 Ed awoke screaming today just after 9 a.m. Edd and Eddy were quick to get over to his house. When asked what the problem was Ed said "Evil Tim has come back for us!" Edd carefully told Ed that there wasnt an Evil Tim. But, Ed disagreed and ran outside yelling that Evil Tim was back. Edd and Eddy followed and soon found Ed at the construction yard painting very weird symbols with cheese and macaroni noodles. Both were quite puzzled but before they could say anything it seemed that birds just came out of nowhere. Ed quickly grabbed them and ran for shelter. The JBC got there just as the birds were swooping in for the Eds. Our expert photographer Daniel B. took some quick shots with his camera before he had to retreat with the rest of us to the lane. Ed kept yelling that we needed to find more rotten spaghetti noodles. Seeing what just happened we trusted Ed and did everything he said. Apparently our actions werent good enough because a weird figure appeared in the mass of birds. We immediately knew who it was. This time we werent so lucky to escape. The creature let out a hideous roar which knocked Edd unconscious. We ran to Eds house and prepared ourselves for the monsters attack. When we got there Ed was missing. Eddy pushed me forward saying that I should be the sacrifice. "Why should I be the sacrifice!?" "Because Im too handsome to be eaten!" said Eddy. The front door was knocked down and we were staring at the pure form of evil. It backed us into a corner and just as Daniel tried to get a picture of it the monster threw him across the room. Eddy and I were next. As it inched closer Ed came out of nowhere in a very weird outfit and began screaming at it in a foreign tongue. The monster screeched and was slowly pulled back into the comic book. We were saved! Ed was truly the hero but we all fainted before we could get an interview. "I mean come on, we were nearly killed!" I'm here at the Culde-sac to tell you about the recent problems. It seems there have been several midnight fridge raids and people aren't too happy about it. Many people think it is Ed doing this, as he has done it before. However Ed and his friends deny it was him at all. "Just because Ed has done it before doesn't mean he has done it this time as well, there are many people who could have done this" states Edd at the scene of the most recent fridge raid. "I'm telling you my stupid brother did it! He always does stupid things like this." Claims Ed's younger sibling Sarah. Most peopledo think the Ed's have done it, however some think they are being framed which has also happened in the past. "It's Jimmy I tell ya! He did this kinda thing before and I bet he's doin it again!" As many accusations as there are there is little evidence to show who has done these raids. A citizen watch program has been started by Peach Creek residents called R.A.F.T. aka Residents Against Food Theives. This watch program insures that no more food will be stolen from the families of Peach Creek. The local residents have been told to keep us updated on any developments. And you can be assured that we will stay on top of this subject until it is solved. we all know about the so called rumor, that's been going on about eddy dating JBC reporter , lynn. and i didnt get much from interviewing Ed and Double D, so this time I was able to interview someone who might know alot more. Connie, so kevin what do you know about eddy and his "girl" experiences? Kevin: Eddy!? Yeah right! He thought he had a date with Nazz! He's a twerp. Kevin: It probably is! He's an immature dork that will do anything for a girlfriend. if so do you think the relationship will last? Kevin: I give it two days. Kevin: I really don't need to say why but I'll some it up in one word... DORK! Kevin: Dorky is just being his stupid self! Really I find it hard to believe but like I said he's a dork. Really if she does have a crush on him I would gag myself because Eddy is as ugly as Rolf's Nana. Rolf: Kevin you son of a gun! No one insults Rolf's Nana!! anything you'd like to ad? any advice etc? A breaking story has developed outside of Jonny's house! It seems that just moments earlier Connie a JBC Freelancer just confessed her love to Plank. Jonny realizing that Plank was frightened quickly called the police and Connie was arrested for two days. Connie is most familiar with writing about rumors that spread throughout the Culde-sac. Well now another rumor has been exposed. One at which she didn't create. According to the most recent publication of Sugar Haters Anonymous, a recent study has found jawbreakers and other sweet substances to be the cause of a host of dental problems. Blamed for problems ranging from gingivitis to tooth loss, Sugar Haters Anonymous decided to take action. It had been a peaceful day in Peachcreek. Johnny was running around with Plank, naked as always, Jimmy had been painting a picture of a flower, and for once one of Eddys scam had actually succeeded. By pretending Eds room was a swamp, Eddy was able to give tours and charge 50 cents per person. Thrilled by the opportunity of seeing a swamp land, the whole neighborhood flocked in and Eddy came out loaded. The Eds rushed down to the candy store, clutching their hard earned money and drooling from anticipation of large, sugary jawbreakers. Running towards the candy store, the Eds were suddenly stopped by a large crowd of protestors gathered around the candy store. It seemed that Sugar Haters Anonymous had finally decided to take action. By blocking off entrance and exit to the candy store Sugar Haters Anonymous planned to keep kids from buying candy. This way no kids can rot their teeth anymore, one of the protesters commented about the situation. "This bites," Eddy said when asked what he thought about the situation. "What am I going to do with this cash now?" "Oh, Ive seen this in a movie before," Ed said when asked if he thought the situation would be resolved any time soon. "The evil vampires from space sucked the blood out of their victims with unrelenting furry. Confused, we turned to Double D for elaboration. "I really think that this is an excellent example of what people can accomplish when they band together. I do, however, find it rather disheartening that they had to protest jawbreakers." As of now, it is anyones guess as to when the protest will end. All we know for sure now is that Eddy will have to find something else to do with the money that is burning a whole in his pocket. We have all seen what Rolf has eaten which really disgusts most of us. However, many people are asking Rolf just how he makes these weird cuisines. You heard me right people are paying Rolf for these recipes. His homeland country loves the idea of him having his own cooking show. The producers at A.K.A. have already been filling out forms for Rolf's new cooking show which will air this Summer with the brand new reality show "Caught On Ed Camera". Both of these shows are scheduled to be a big success. Rolf's new show will be called "Rolf's Wonderful Food From My Home Country". Producers are working on changing the title. When asked about this new cooking show Rolf had this to say. "It warms my heart to see me son of a shepard take a task this great to help the natives of my home country." Wow is it just me or did that actually sound normal? Everyone is excited about this new show and all of us here at the JBC can't wait for it to air.